With the Schlage Touch Keyless Touchscreen Latitude Lever with Century Trim in Satin Nickel, there's no key to lose, no re-keying or cutting new keys no keys at all, thanks to our cylinder-free design. You can finally go for a run or take the dog for a walk without juggling keys or stuffing them in your sock. All in a slim profile and stylish trim that pairs perfectly with interior hardware. The Latitude lever offers a crisp perspective on minimalist design with its clean lines and rectangular features, while the Century trim is chic with a delicate, slightly curved shape especially unlocks when wrapped in our versatile Satin Nickel finish. Plus, it's been designed and tested with strength and durability in mind. The Schlage Camelot Lower Half Handleset and Accent Lever in Satin Nickel is perfect for use with an electronic deadbolt for a complete front entry set. The Accent lever is widely popular for its elegant wave-like design that effortlessly matches a room's style without overshadowing it especially when wrapped in our versatile Satin Nickel finish. Plus, it's been designed and tested with strength and durability in mind. The Schlage Siena Knob Keyed Entry Lock in Satin Nickel unlocks when the door is opened from the inside, allowing you to leave quickly and conveniently, and re-enter easily. The Siena knob's eye-catching oval shape gives it a unique and memorable look especially unlocks when wrapped in our versatile Satin Nickel finish. Plus, it's been designed and tested with strength and durability in mind. Touchscreen Lock Century/Latitude Lever Satin Nickel With the Schlage Touch Keyless Touchscreen Latitude Lever with Century Trim in Satin Nickel, there's no key to lose, no re-keying or cutting new keys no keys at all, thanks to our cylinder-free design. You can finally go for a run or take the dog for a walk without juggling keys or stuffing them in your sock. All in a slim profile and stylish trim that pairs perfectly with interior hardware. The Latitude lever offers a crisp perspective on minimalist design with its clean lines and rectangular features, while the Century trim is chic with a delicate, slightly curved shape especially unlocks when wrapped in our versatile Satin Nickel finish. Plus, it's been designed and tested with strength and durability in mind. 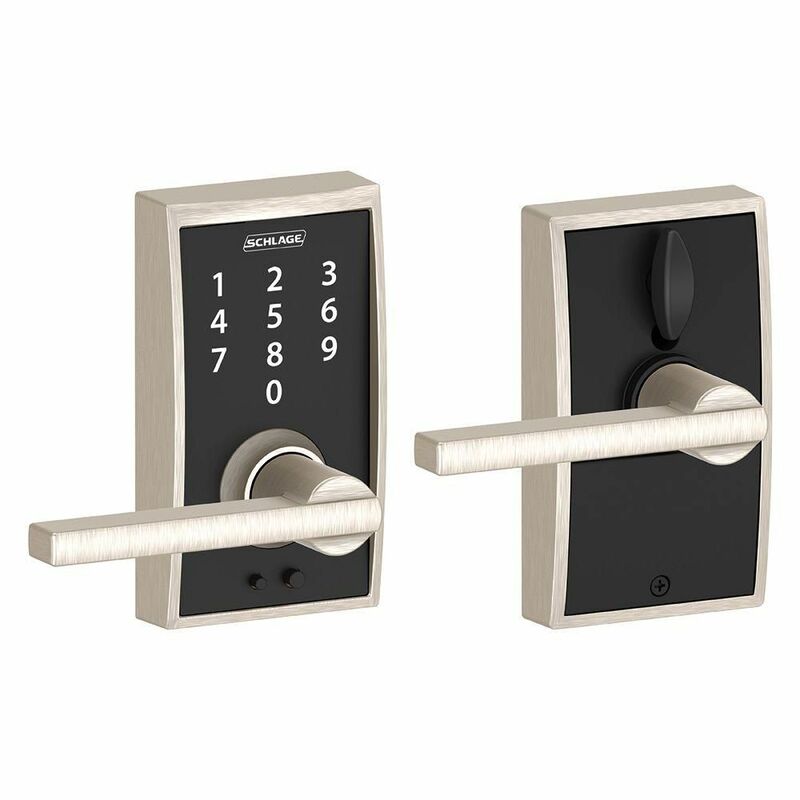 Touchscreen Lock Century/Latitude Lever Satin Nickel is rated 4.4 out of 5 by 38. Rated 5 out of 5 by Bruce from Nothing like a Schlage! Love the quality and design.... Nothing like a Schlage! Love the quality and design. Rated 5 out of 5 by Colette from We LOVE this door knob. We have an 11 year... We LOVE this door knob. We have an 11 year old and an 8 year old who both use it with no issues. It’s also very easy to create codes and erase them, the kids love having their own codes as well. Rated 5 out of 5 by floJ from Selected this lock because of the touchscreen. Yes! ... Selected this lock because of the touchscreen. Yes! no more buttons. But, unfortunately, the numbers on the screen require a push-in, and are not touch to activate. A simple style and operation for the busy life style, sturdy, with consistent performance. Rated 5 out of 5 by babu from Easy to install and operate. Looks great, works great!!!... Easy to install and operate. Looks great, works great!!! Rated 3 out of 5 by LindaG from We had our lock installed about a year ago and it worked very well until it stopped working. The... We had our lock installed about a year ago and it worked very well until it stopped working. The handle stopped opening the door from the outside even when it was unlocked. Customer service said it was a mechanical problem and they are sending a new lock. However, since the door cannot be opened for the outside with this problem, we are concerned it could happen again with the new lock. If there was a key to override this problem it would be a 5 star lock.